Have magnetic polishes become the new crackle top coats yet? Are we bored of them? Nails Inc. hope not because they’ve just released their newest shade: Whitehall. Whitehall is a teal green/blue that offers complete coverage in a single coat. Not, almost complete – fully complete. This was one of the quickest manicures I’ve done in ages, quick drying too – it literally took me around 10 minutes tops from start to finish. I’m not sure if you can make out from the above photo but this one dried to a fairly matte finish compared to some of the other magnetic polishes I’ve tried in the past. It’s a striking combination on the nails and I didn’t encounter any magnet mishaps – the results were pretty consistent from nail to nail. Ultimately, this is one of the better magnetic polishes I’ve tried – I’m not sure if this shade is available cheaper from the other brands (17, FashionistA etc) but I haven’t got any moans about the Nails Inc. version! Nails Inc. 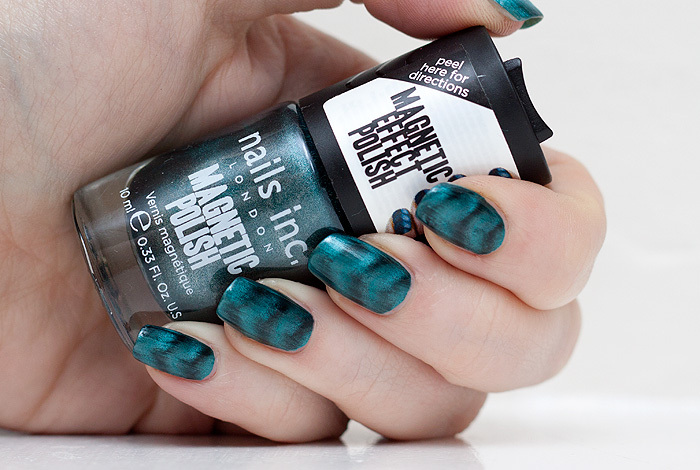 Magnetic Polish in Whitehall is available to buy online from Nails Inc. priced at £13.00 (ouch). I never really got caught up in the magnetic craze, I bought 3 of them (one Nails Inc and 2 17 ones), but I didn’t find them very easy to use and the 17 ones chipped/peeled off very quickly, so not worth the effort to me. Got rid of my magnetic polish, couldn’t be faffed! This looks lovely on your nails! Unfortunately I almost never paint my nails as I’m not allowed to for work, so I rarely buy nail polish. Although this would look quite nice on my toes….. I was going to sit out the magnetic polish craze but now I’ve seen this gem and I don’t think I can any more. Wow that polish pops! I think I ordered the purple one (can’t remember and am too lazy to check) from BeautyBay and I can’t wait to get it in the mail 😀 I’ll probably wear it everyday fr weeks! I just don’t see the point in magnetic polishes! I’d like it (and possibly even buy one!) if you could do anything more than a daft wavy pattern.